Having sensitive teeth can mean anything from getting a mild twinge to having severe discomfort that can continue for several hours, when you drink or eat something acidic, cold, hot or sweet. The pain can come and go, with some times being worse than others. Sensitivity that lingers for more than a minute can be an early warning sign of a more serious dental problems. Many people suffer from sensitive teeth and it can start at any time. It is more common in people aged between 20 and 40, although it can affect people in their early teens and when they are over 70. Brushing too hard (‘toothbrush abrasion'), and brushing from side to side, can cause enamel to be worn away - particularly where the teeth meet the gums. The freshly exposed dentine may then become sensitive. Dental erosion: this is loss of tooth enamel caused by attacks of acid from acidic food and drinks. If enamel is worn away, the dentine underneath is exposed which may lead to sensitivity. Gums may naturally recede (shrink back), and the roots of the teeth will become exposed and can be more sensitive. Root surfaces do not have an enamel layer to protect them. Gum disease: a build-up of plaque or tartar can cause the gum to recede down the tooth and even destroy the bony support of the tooth. 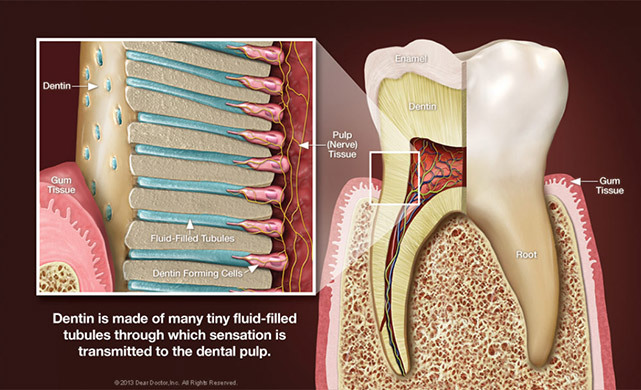 Pockets can form in the gums around the tooth, making the area difficult to keep clean and the problem worse. Tooth grinding: this is a habit which involves clenching and grinding the teeth together. This can cause the enamel of the teeth to be worn away, making the teeth sensitive. A cracked tooth or filling: a cracked tooth is one that has become broken. A crack can run from the biting surface of a tooth down towards the root. Extreme temperatures, especially cold, may cause discomfort. There are many brands of toothpaste on the market made to help ease the pain of sensitive teeth. You should use the toothpaste twice a day to brush your teeth. You can also rub it onto the sensitive areas. These toothpastes can take anything from a few days to several weeks to take effect. You may find that hot, cold, sweet or acidic drinks, or foods like ice cream, can bring on sensitivity, so you may want to avoid these. If you have sensitivity when brushing your teeth with cold water from the tap, you may need to use warm water instead. It is important to keep brushing your teeth regularly, but also not too hard, using an electric brush, that has warning lights on it can help you to not over brush. If you have tried treating your sensitive teeth for a few weeks and you have had no improvement. We will be only too happy to see you here at My Dental Care. We will provide you with a full examination and will talk to you about your symptoms. We will try to find out what is causing the sensitivity and find the best way of treating it. We may treat the affected teeth with special ‘de-sensitising' products to help relieve the symptoms. Fluoride gels, rinses or varnishes can also be applied to sensitive teeth. These can be painted onto the teeth at regular appointments one or two weeks apart, to build up some protection. Sensitivity can take some time to settle, and you may need to have several appointments. If this still does not help, we can seal or fill around the neck of the tooth, where the tooth and gum meet, to cover exposed dentine. day, with fluoride toothpaste. Consider using toothpaste specially designed for sensitive teeth. Use small, circular movements with a soft- to medium-bristled brush. Try to avoid brushing your teeth from side to side. Have sugary foods, and fizzy and acidic drinks, less often. Try to have them just at mealtimes. If you grind your teeth, talk to your dentist about whether you should have a mouthguard made, to wear at night.